On the evening of 23 July 2016, the European premiere of the brand new play Coriolanus and Du Liniang by Zhejiang Xiaobaihua Yue Opera Troupe was performed at the Peacock Theater, London. 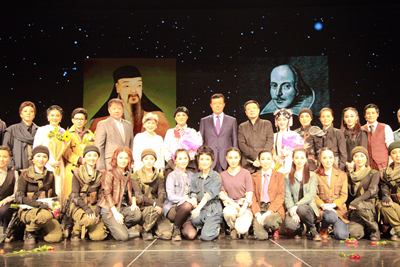 The show unveiled the second phase of the "Dialogue between Tang Xianzu and William Shakespeare", and began its European tour. Chinese Ambassador Liu Xiaoming and Madam Hu Pinghua, together with an audience of more than 900 from different countries, watched the performance. The Yue opera Coriolanus and Du Liniang is an innovative production combining Shakespeare's tragedy Coriolanus with Chinese Ming dynasty dramatist Tang Xianzu's master piece The Peony Pavilion. It is a modern description of the tragic life of the legendary Roman general Coriolanus, who fought for keeping his ideal, and the legend of Miss Du Liniang coming back to life to meet her lover Liu Mengmei. This is the first time in China and around the world that the classics of the two masters are brought to one stage. 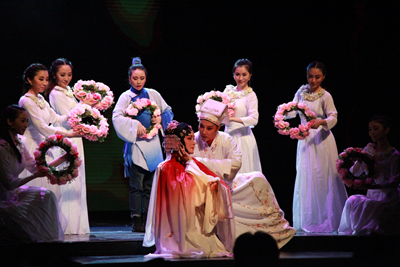 Even though Tang and Shakespeare were separated by thousands of miles, the characters in their works meet on the stage of the Yue opera through a "dream" to discuss the meaning of life and death. Mao Weitao, a famous Yue opera performing artist and Head of Xiaobaihua Yue Opera Troupe, plays both Coriolanus and Liu Mengmei. With unique Yue opera skills, more than 40 young and well-trained performers put up an amazing and brilliant show, entwining the star-crossed lovers in Chinese culture with the legend of the bright and brave general. The audience was fully immersed in the unique art of Yue Opera and gave enthusiastic applauses to the performers. 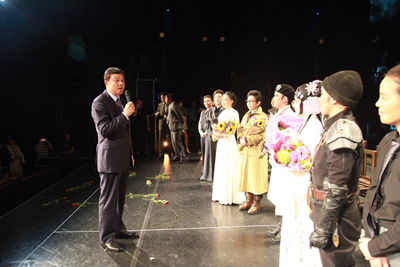 Ambassador Liu visited the cast members after the show and congratulated them on the success. 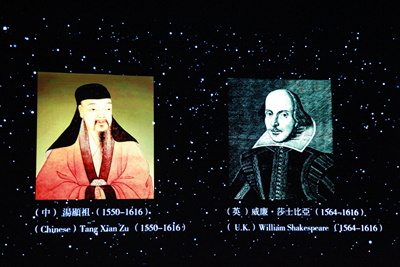 President Xi Jinping suggested during his state visit to the UK last October that China and the UK 2016 could commemorate the 400th anniversary of the passing of Tang Xianzu and William Shakespeare in 2016, to facilitate the exchanges between the two countries and deepen mutual understanding between their peoples. This performance of Xiaobaihua Yue Opera Troupe in the UK is an outcome of the State Visit and also one of the important programmes of the 400th anniversary commemoration. It will contribute to the cultural exchanges between China and the UK in the "Golden Era" and add splendor to the commemoration of the two great playwrights. The show made its debut in the UK and will continue to tour France, Germany and Austria.